Happy Peace Day to you all! What a pic!!!! As stated in an earlier post, sometimes a picture is all you need to convey the message. Thank you Safety Harbor, Florida for five years of investing in peace. Are you interested in celebrating Peace Day with the people that started this movement? Join the global celebration of Peace Day by logging onto Facebook and watching live feeds on 21st September from the Peace One Day Headquarters. NOW…. the quote we use every year because … well ……. it’s perfect. So, the perfect pic gets the perfect quote. There must be peace in the nations. There must be peace in the cities. There must be peace between neighbors. There must be peace in the home. There must be peace in the heart. RIP Gerry Moynihan. Your birthday party gave us the perfect picture of peace. And we are out of here!!! By binvested  Posted in City of Safety Harbor, Florida, International Peace Day, life, local living, Peace, Peace Day, Peace One Day, Uncategorized	 Tagged 21st September, binvested in peace, community, Florida, Gerry Moynihan, International Peace Day, Jeremy Gilley, peace, peace one day, safety harbor, United Nations, Village, Who will you make peace with? One more “bonus” day, because why not. We are so thankful that we live in a community that understands that we’re all in this together. When we asked for help, we got it with gusto, and it’s ONLY because the residents of Safety Harbor committed to assisting us in making it happen. Sometimes words just can’t express what this project means to us, but pictures do!!! Who will you make peace with? What will you do for peace one Peace Day? Why not use social media to get the message out? Tweet, share or like your way to peace, and tell all your followers about Peace One Day. By binvested  Posted in City of Safety Harbor, International Peace Day, life, local living, Peace, Peace Day, Peace One Day, Uncategorized	 Tagged #PeaceDayProject, 21st September, binvested in peace, community, FL, Florida, International Peace Day, Jeremy Gilley, peace, peace one day, safety harbor, Village, Who will you make peace with? We’re winding down our peace project. Hopefully, if you participated, you’ll find your pic in one of our collages. This day was unanimously voted in by the United Nations back in 2001. In September of 2015, the UN set forth a plan to help further along the idea of a more peaceful society. They adopted a set of goals to end poverty, protect the planet, and ensure prosperity for all. It’s called “The 17 Sustainable Development Goals” and they consider these to be the building blocks to achieve peace in our world. They also have created “The Lazy Person’s Guide to Saving the World” which gives simple ideas that you can choose to adopt into your daily life to help make an impact. Check out their website which is listed below. Again … the questions …..
What will you do for peace on Peace Day? How about takin’ it to the streets!!! Organize a walk for peace. Bring together your friends, family and community to unite on Peace Day, 21st September. Want to be anti-social? Take your own personal stroll in support of peace and global unity. Walk on …. in peace!!! RIP Lois Spencer…we miss you. By binvested  Posted in City of Safety Harbor, Florida, International PeaceDay, life, local living, Peace, Peace Day, Peace One Day, Uncategorized	 Tagged "The 17 Sustainable Development Goals", "The Lazy Person's Guide to Saving the World", 21st September, binvested in peace, community, Florida, International Peace Day, Jeremy Gilley, life, Lois Spencer, peace, peace one day, safety harbor, United Nations, Village, villagers, Who will you make peace with? Happy Monday!!! We’re counting down to Peace Day, and by now, we hope you are picturing what it would be like to live in a peaceful world. We’ve shared all four #PeaceDayProjects, so the next few days we will be posting more pics of our villagers from Safety Harbor, Florida. Our town is approximately five square miles, which means we’re ALL neighbors. See….. we’re lucky! We aren’t faced with conflict like other parts of the globe. That’s why we support and promote the peace movement … even if it’s just for a day. In an earlier post, we said that many hands have touched our yellow peace poster to pose for peace, so it is with great gratitude for your help in celebrating Peace One Day. Aaahhhh, you villagers are the best!!! Enjoy Monday’s collage!!! And now, let’s return to the questions. How about breaking bread with neighbors or strangers. Cook a meal, get take-out, have a picnic and do it in the name of peace on 21st September. Cheers! And pass the peace, please!! By binvested  Posted in Uncategorized	 Tagged #PeaceDayProject, 21st September, binvested, binvested in peace, community, Florida, Jeremy Gilley, life, nonviolence, peace, peace one day, safety harbor, United Nations, Village, villagers, Who will you make peace with? Helloooo, and welcome back! The 2016 Peace Day festivities are underway, and we hope that you enjoying this project as much as we enjoyed creating it. This project is about making a little change in the world and asking you all reading this to make a little change, as well. Peace is all about individual action so take some time and think about what your contribution can be. And, yes we have ideas for you in each post leading up to Peace Day. 2014 showed some impressive statistics with the Peace One Day Report which recorded over 1 billion people exposed to Peace Day messages and 10 million people behaving more peacefully on the day as a result of the movement. Our throwback collage from 2014 was about how peace comes in all languages. It is with sincere appreciation to all the villagers that took the time to help us with expressing peace in their native tongue. Here’s an idea for you!!! One Day One Goal uses the power of sport in observation of Peace Day, 21st September. Organize a soccer match or even a tournament dedicated to peace. Not a soccer player??? Pick whatever sport you like. By binvested  Posted in language, Peace, Peace Day, Peace One Day, Uncategorized	 Tagged #PeaceDayProject, 21st September, binvested, binvested in peace, community, Florida, inspiration, International Peace Day, Jeremy Gilley, Jude Law, languages, peace, peace one day, safety harbor, United Nations, Village, villagers, Who will you make peace with? We’re counting down to Peace Day with some throwback pics from our past projects that were registered with the POD Organization. But, first … we would like to give you some statistics . For Peace Day 2013 a 68% increase in the number of those aware of the day was recorded. That’s 470 million peeps!!! And, of that number, around 4-8 million peeps behaved more peacefully in their own lives as a result of this initiative. Can you say AWESOMESAUCE!!!! The year 2013 meant that we had to step it up a notch … which meant we had to have a plan. We decided to ask our city government to take part in our #PeaceDayProject, of which, they gladly accepted. Thank you to the City of Safety Harbor for being part of that 470 million. Let’s try some art! Paint, sculpt, sketch or photograph … changing the world by expressing yourself for Peace on that day. Note: No names will be listed on any of the pics, so please stay tuned all week to see if you made it onto a collage. Who knows, we may even have a couple of extra posts this week! Be on the lookout and peace be with you! By binvested  Posted in City of Safety Harbor, Florida, International Peace Day, life, local living, Peace, Peace One Day, Uncategorized	 Tagged #PeaceDayProject, 21st September, binvested, binvested in peace, City of Safety Harbor Public Works, community, Florida, Jeremy Gilley, Kelliann Gerlach, life, Lisa Kothe, non-violence, peace, peace one day, safety harbor, Safety Harbor Library, Safety Harbor Parks and Rec, Shannon Schafer, Village, villagers, Who will you make peace with? Can you imagine living in a world free from conflict, war, hate crimes, bullying, domestic and gender-based violence??? It would be nice, wouldn’t it??? But, that’s not the case. The world seems full of terror and hate, which fill our lives with fear, anxiety, and turmoil. That’s why we support International Peace Day, a day of global unity and intercultural cooperation. A day that measures the amount of ceasefire and nonviolence all over the globe, and is celebrated on 21st September. Peace One Day was founded by Jeremy Gilley, an actor turned filmmaker, who became concerned about what was going on in the world. He decided to give the world some hope, and in 1999 launched the Peace One Day Organization, which was unanimously adopted by the United Nations in 2001. Now it’s time to take it local!!! We are celebrating our fifth year of promoting Peace Day with … of course … another week-long project. Every year we register this project with the Peace One Day Organization to be a part of the measurement of peace and peaceful activities. We also pick a different theme for every #PeaceDayProject. We’re taking a walk down memory lane and saying thank you to all the residents that helped us promote peace throughout the last four years. 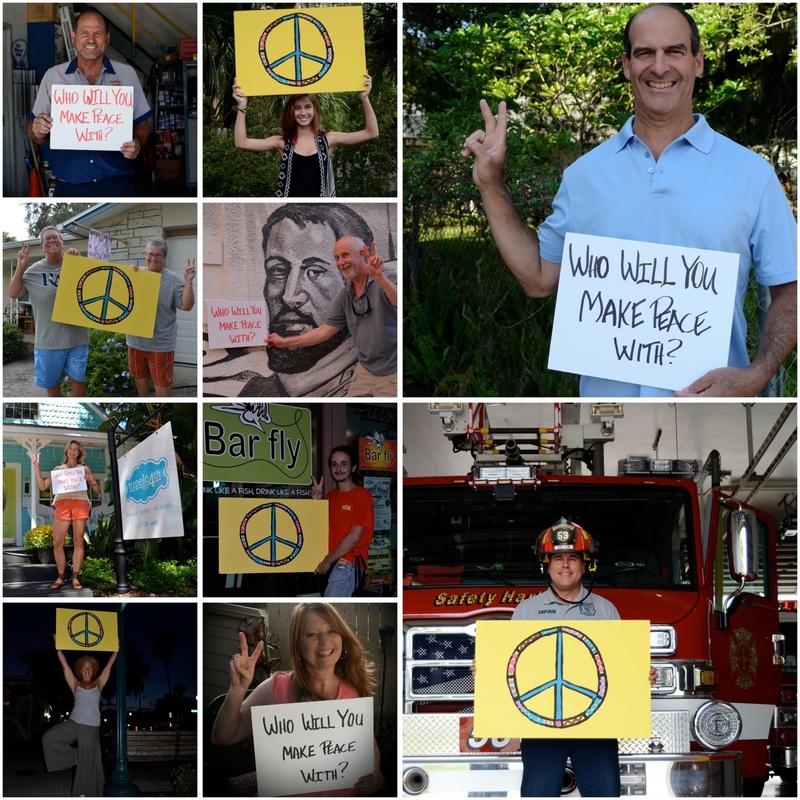 A collage of pics every day of all you wonderful villagers from Safety Harbor, Florida that helped us promote peace will be published along with the theme chosen for that year. 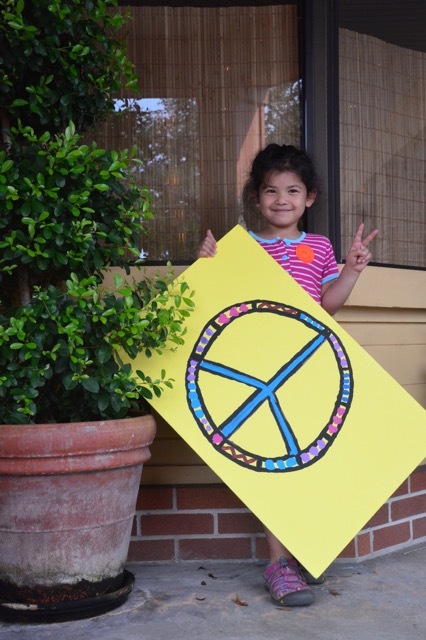 By holding our little yellow peace poster, you also helped raise awareness for peace on a statistical level, as well. So, here we go kicking off Peace Day! Follow us on our journey and see if you made it in the collage. This pic is from 2012 and our theme was . . . . . well . . . . . there was really no theme at all, but that’s okay. It’s about the path to peace on all levels. Don’t worry!!!! We’ll be listing some ideas to help you celebrate this most important day. By binvested  Posted in International Peace Day, life, local living, Peace, Peace Day, Peace One Day, Uncategorized	 Tagged 21st September, binvested in peace, community, FL, International Peace Day, Jeremy Gilley, non-violence, peace, Peace One Day 2016, safety harbor, Village, villagers, Who will you make peace with? Thanks for stopping by! We hope you are feeling more peaceful and hopeful for a more peaceful society in the future. Jeremy Gilley, the founder of Peace One Day, has recorded over 900 hours of young people’s thoughts on the idea of a starting point for peace. Through a window of a day, they would be able to get involved in the peace process through art, sport, and music … helping to move the efforts for a more peaceful society forward. The year 2015 statistically showed this day becoming self-sustaining with an estimated 1.5 billion people now exposed to Peace Day messages with 709 million people now aware of Peace Day. Of those aware, an estimated 13 million people behaved more peacefully on that day. Let’s move onto our local project for 2015. It was all about raising awareness for peace in the home. We featured kids and canines ….. child abuse and animal abuse are not very peaceful in our book. What about you? Pictured above is our collage of our local littles and rescue pups. Just look in their eyes and see the pure love and the pure joy of ………. being. They make the world a better place so we should take better care of them. Don’t you agree?? Okay … back to the questions …. Today’s suggestion is to make it a movie night. Tune into YouTube and screen Jeremy Gilley’s film, “Day After Peace” which charts his journey creating Peace Day. Popcorn is optional but always more fun. We hear that you can still buy Jiffy Pop to add a “pop” to the evening! We know the littles might find it quite intriguing! Have a peaceful 24 hours! By binvested  Posted in children, City of Safety Harbor, Peace, Peace Day, Peace One Day, Rescue animals, Uncategorized	 Tagged #PeaceDayProject, 21st September, binvested, binvested in peace, community, Florida, Jeremy Gilley, life, peace, peace one day, Photography, safety harbor, safety harbor businesses, United Nations, Village, Who will you make peace with? The #PeaceDayProject2015 … 21st September!!!!!!!!! HAPPY PEACE DAY TO ALL!!! 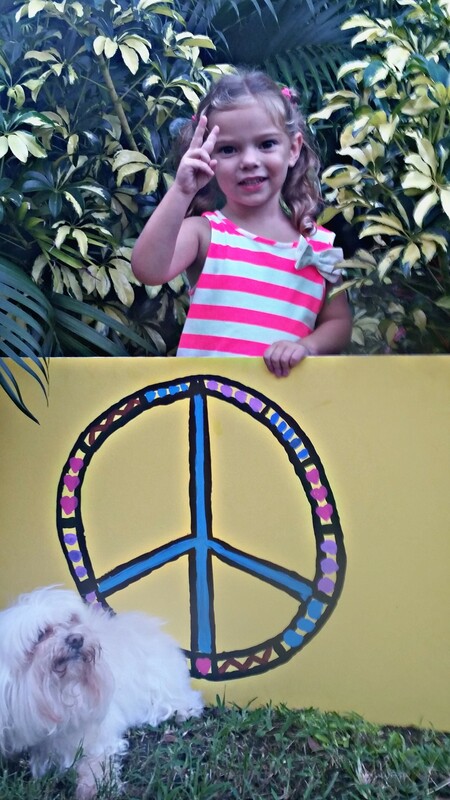 Thank you to all the lovely children and rescue pups that participated in our #PeaceDayProject2015. There is nothing better than experiencing the pure essence of kids and canines! Pictured just like a clock, check out ….. Kayla at 12 o’clock, Titiana at 3 o’clock, Isabelle at 6 o’clock and Elise at 9 o’clock, holding Cody. It’s “time” for everyone to celebrate Peace ….. just for one day. Who knows where we can go from there??? 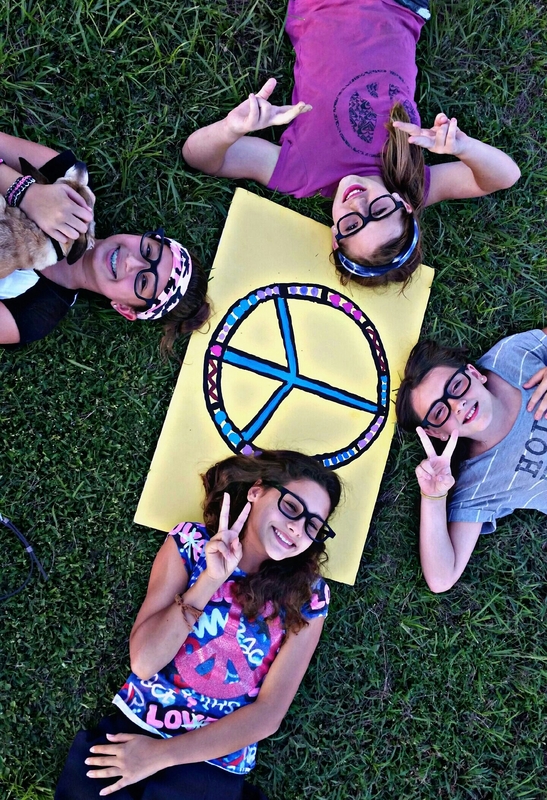 Thank you Dr. Mariana Delgado for allowing your daughter, Elise and her friends to participate in the #PeaceDayProject2015. Who will YOu make peace with on 21st September????????? If you did not have time to watch the 17 minute video about Peace One Day on Sept. 14th to kick off the #PeaceDayProject2015, maybe you can watch the 1 minute video to end the project. PLEASE…AND…THANK YOU!!! By binvested  Posted in children, local living, Peace, Peace Day, Peace One Day, Rescue animals, Uncategorized	 Tagged #PeaceDayProject2015, Akon, binvested in peace, Dr. Mariana Delgado, Florida, Jeremy Gilley, Jude Law, Lao Tzu, music, non-violence, peace one day, safety harbor, United Nations, Who will you make peace with? It’s almost … Peace Day 2015! let’s fast forward to 2050. What do you think Peace Day will be like??? We’re not sure, but if we keep working for peace on all levels, we may be able to reach the largest ever recorded cessation of hostilities both domestically and internationally. It’s all about individual action and getting children involved. With that said, we would like to share with you a non-profit organization that focuses on getting the “littles” involved in Peace Day. They were inspired by Peace One Day and their campaign to raise awareness on the 21st September. They are a non-profit enterprise, and all money raised will go directly back into the company. It’s about children and education ….. it’s about peace, and moving it forward into the future. We refer to them as our friends in peace, but you’ll find them on Google, Facebook, Twitter and Instagram as … Postcards For Peace. They are all about getting young people involved in the peace process by raising awareness for peace and hosting events like a design competition and the postcard exchange network. All the info will be on the web address listed below, as well as, an introductory video of what Postcards For Peace is all about. Please watch and be inspired! It’s time for another pic in our kids and canines week. Here is the lovely angel, Zoey and her rescue, Gracie. Thank you to Safety Harbor residents, Gloria and Kevin Francis for letting them participate in our peace party. Today, instead of a question, we would like to give you a thought that was given to us by our friends in peace ….. I BELIEVE I CAN CHANGE MY WORLD!!!! By binvested  Posted in children, International Peace Day, Peace, Peace Day, Peace One Day, Rescue animals, Uncategorized	 Tagged #PeaceDayProject2015, animal cruelty, binvested in peace, community, Florida, Jeremy Gilley, Jude Law, non-violence, peace one day, Postcards for Peace, safety harbor, stop child abuse, Village, villagers, Who will you make peace with? 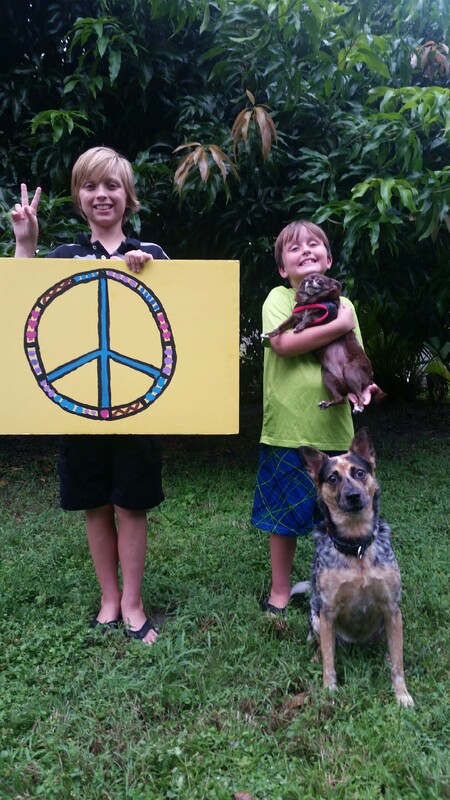 Nothing cryptic here 🙂 ….. just kids and canines celebrating peace working up to International Peace Day, the 21st September. Peace One Day has many goals … ceasefire, non-violence, peace within our homes, schools and communities. They also measure the amount of people coming together in the name of peace. This day is far from symbolism … that’s why measurement of peace on all levels is so important. Now, it is time to promote peace together by individual action!!! It’s called the “Thunderclap” and it’s an easy way for individuals to promote Peace One Day. It’s just a little click of a button and Thunderclap does the rest. It amplifies the message of peace and spreads it on social media via Twitter, Facebook or Tumbler. By registering on Thunderclap, you are allowing them to share a message on your behalf in support of Peace One Day. It’s just ONE message … ONE time only, which will be on Peace Day. Why not put your individuality to work. Speak out for peace within homes, schools and communities. Speak out against child abuse ….. speak out against animal cruelty ….. let your voice be counted!!! Our pic of the day is from Ed’s Fine Wines in the village. His name is Brunello, and he is promoting a peaceful and cruelty-free society. Thank you to Brunello’s dad, Ed Giancola for letting Brunello be part of our #PeaceDayProject2015. Always ……… the question is ……… Who will YOu make peace with??? Peace One Day Join the movement! Join the Thunderclap! By binvested  Posted in animals, children, International PeaceDay, local business, local living, Peace, Peace Day, Peace One Day, Uncategorized	 Tagged #PeaceDayProject2015, 21st September, binvested in peace, Brunello's Wine Blog, Ed Giancola, Ed's Fine Wines, Facebook, Florida, International Peace Day, Jeremy Gilley, Jude Law, non-violence, safety harbor, Safety Harbor business, social media, stop animal cruelty, stop child abuse, Thunderclap, Tumbler, Twitter, Village, Who will you make peace with? Well, the weekend is upon us. We hope that you are thinking and acting more peacefully as we shift from work mode to weekend mode. For the sake of any newbies to the #PeaceDayProject2015, our theme this week is kids and canines! This week-long project is about getting involved. What can you do to raise awareness for peace in the home? What can you do to stop animal cruelty? What can you do to support Peace One Day??? You can shop for peace!!! It’s the weekend ….. it’s time for kicking back and doing a little retail therapy, don’t ya think??? The Peace One Day website will be listed below, so take a look and start hitting that “add to cart” icon. Fashion Designers Marc Jacobs, Dave Little, Stella McCartney and Toby Mott are all contributors with some really unique t-shirt designs that support the campaign. And if you live around the village, please visits the businesses that agreed to be a part of our #PeaceDayProject2015. They didn’t do it for the advertising ….. they did it because they believe in this movement. Pictured: Our crew of the day!!! Left to right we have Drew, Jake holding Hershey with Chloe keeping the family corralled together. Thank you Andy and Cammie Zodrow for allowing your family to participate in the #PeaceDayProject2015. So, remember to love your littles ….. treat all animals with kindness ….. shop for peace ….. support your local businesses, because they want peace. AND … the question of the day …. Who will YOu make peace with on 21st September???? Peace One Day Join the movement and shop for peace! By binvested  Posted in International Peace Day, local living, Peace, Peace Day, Peace One Day	 Tagged #PeaceDayProject2015, 21st September, adopt don't shop, Cammie Zodrow, Clearwater Marine Aquarium, Dave Little, Fashion Designers, Florida, International Peace Day, Jeremy Gilley, Jude Law, Marc Jacobs, non-violence, peace, retail therapy, safety harbor, senior dolphin trainer, shop for peace, Stella McCartney, stop animal cruelty, stop child abuse, Toby Mott, Vice-Mayor Andy Zodrow, Village, villagers, Who will you make peace with? Happy Thursday to all. We’re here all week building peace one day at a time. As you can see, the #PeaceDayProject2015 is all about kids and canines, but we would like to let you know of something Peace One Day is trying to create … AND … how you can help!!! Peace One Day actually measures the amount of peaceful activities on the 21st September on all levels. We feel that everyone has a responsibility to institutionalizing this day, and no effort is too small. That’s why we have registered this project for the last 4 years. Now, onto what you can do!!! Let’s make millions more aware of Peace Day by contacting the world’s most powerful search engine and asking for their support in this cause. YEP …. that would be Google …. and, YES …. we’re talking Google Doodle!!! Email Google and ask them to dedicate their doodle on 21st September to peace. You can suggest your own Google Doodle!!! The address will be listed below. Pictured: What a trio!!! Left to right we have Jaxson, Hope and Nikki, and oh…what fun it was to meet these jewels from the village. Thank you to their parents, Steve and Kelli Chickos, owners of The Dog House of Safety Harbor for letting them participate in our project. We end with this question…..
Who will YOu make peace with on 21st September??? Peace One Day Join the movement!!! Woohoo!!! The #PeaceDayProject2015 is underway!!! We’re here all week celebrating peace at every level. This year we have chosen children and rescue animals as our theme. Both have pure essences and a unique quality that most of us forgot along the years ….. unconditional love. So why is there so much abuse of these innocent souls??? A question for you to ponder as this week plays out. It’s the age of innocence … in dog years!!! Because, that’s how we roll!!! 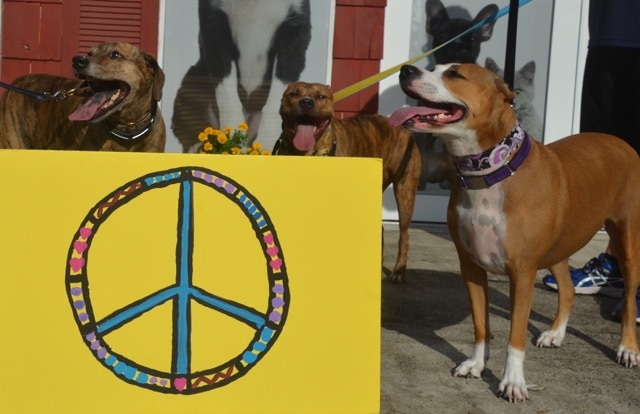 We hope you enjoy seeing some of our little villagers, as well as, some of our canine villagers promoting peace! Pictured: Marissa holding the peace poster we made 4 years ago. Thank you to her parents, owners of Sabai Asian Bistro in the village for letting her participate in our celebration. Do you think one person can start a movement??? Please watch this 17 minute video and see how one man and one crazy idea has turned into a global celebration for peace. No one can relay what International Peace Day really means like the founder, Jeremy Gilley. 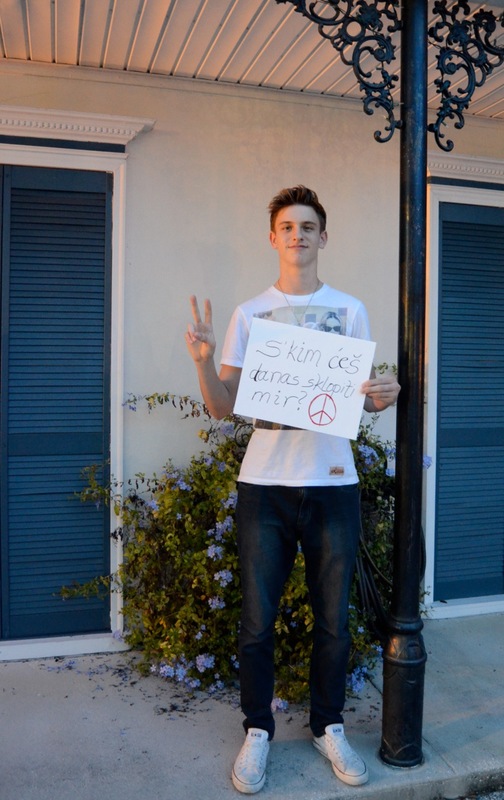 Sooo, here we go again… the #PeaceDayProject2015. It’s our 4th year doing this week-long project promoting peace on all levels. Tune in tomorrow to find out how we will be celebrating ….. BUT …. we would appreciate it if you watch the video! *A new sign off for this week. We hope that you enjoyed our week-long project dedicated to a much-needed cause…PEACE!!! Recording artist, Akon will headline the Peace One Day Celebration at Goma International Airport in celebration of this most important day. There will be a multitude of other performers in support of Peace Day, and the 15 year journey that has made this day… a day of empowerment… a day of kindness… a day of gentleness… a day of love. No one can deny the power of love. In essence, it is all there is. Here is our collage of villagers and their expressions of peace on every level. Special thanks to Mayor Andy Steingold and Fire Department Captain, Ray Duke for your participation in our #PeaceDayProject2014. It is with deep gratitude to this list of villagers that helped us with this project. We had an amazing and uplifting time working to promote Peace Day. Tune in tomorrow for one more peace post for 2014. Keep it goin’ ya’ll!!! Now, the quote we have used for the last 3 years. There is nothing better than this. So it’s a threepeat!!! As we said at the beginning … three times a charm … so we hear. May you have peace in your mind…peace in your heart…peace in your core…always. Watch the Peace One Day Celebration on You Tube! It’s Saturday…the day before Peace Day. Are you feeling peaceful??? Well, any degree of peace that you feel is the way to a more peaceful planet. It all starts with you and your thoughts of what peace can bring– into your heart…your mind…your core…AND…Mother Earth. Over a half a billion people around the globe play games for at least an hour a day. Peace One Day and lead partner, Playmob are promoting peace through virtual worlds. Using that “artificial intelligence” to change imput into a more peaceful environment. We likee…so do not AFR (away from keyboard) for very long. He’s one of our favorite villagers. 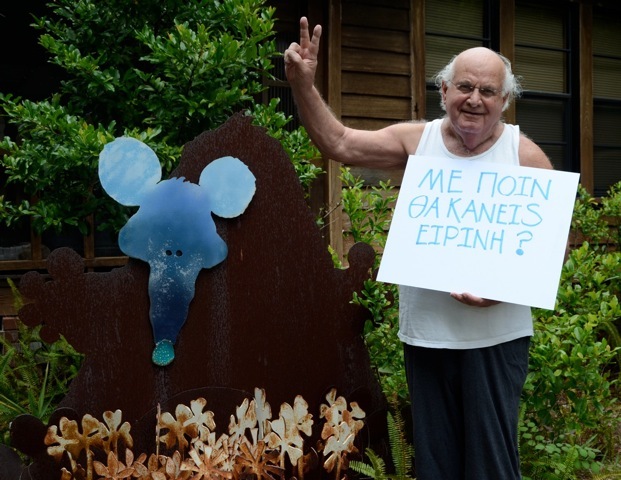 Here he is…drumroll please…Dino Kotopoulis asking in Greek. Who will YOU make peace with??? Started his career in advertising in the 1950’s and worked on campaigns like Starkist “Charlie the Tuna” brand, for which he won a Clio award. He has also worked with Disney, Universal Studios and Hanna Barbera Cartoons. He is known for his humorous caricature drawings and sculptures in wood and metal, and now is working on illustrations for a book by the name of “Captain Tortuga and the Treasure of Sand Key” by David Kinne. Why not search Dino Kotopoulis and check out his story. NOTHING IS MORE precious than peace. PEACE IS THE MOST basic starting point FOR THE ADVANCEMENT OF HUMANKIND. It’s Friday!!! It’s almost time for the weekend…it’s almost time for International Peace Day. We sincerely hope the you make this upcoming day– YOUR day. And, by doing so, we KNOW that peace will envelop your being and your soul will start to smile again. Another one of Peace One Day’s events is…Set For Peace. Whether you are a producer, DJ, or just someone who loves music, play a set for peace on Peace Day, 21st September. Bringing people together in the name of peace by the power of music encourages positive change. It’s all about peace in da club, so play that funky music, ya’ll!!! Singer/Songwriter, Leon Majcen, asking… in Bosnian. Check out Leon’s new song “I Want to See You” and learn of his new album on his website listed below. I’m calling all the world. Calling the whole wide world. C’mon people will you help me? Let’s scream and shout, because we want peace. Let’s keep this peace train movin’ along. We want everyone to understand the importance of Peace Day and the magnitude of transformation that can be achieved if we all put forth a little effort in making peace a priority in our lives. One Day One Choir is one of Peace One Day’s campaigns used to bring awareness; using the power of choral singing to promote peace and unity on Peace Day, 21st September. Start warming up those pipes…sing loud and sing proud…for peace. SURPRISE!!!! Today we have a twofer. 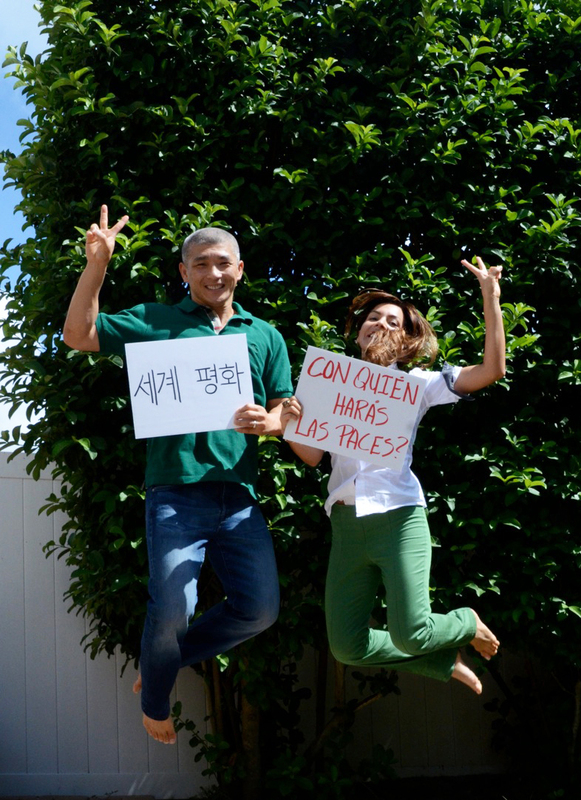 Jae Bang and his wife, Aline Solis-Bang are jumping for joy because they are aware that individual action is the most important factor in manifesting the greatest gathering of people standing together in the name of peace. Jae is in the medical business, and his wife, Aline, is a Fashion Designer and entrepreneur. Here they are with Jae proclaiming WORLD PEACE in Korean, and Aline asking…in Spanish. Peace is more than the absence of war. Peace is accord. Harmony. Happy Wednesday!!! We hope you are having a great week, and giving your attention to promoting peace at every level. Let’s move onto another of POD’s events. One Day One Dance uses the creativity of dance to promote peace. Anybody can get involved and all styles of dance are welcome. Dancin’… Dancin’… Dancin’…be a dancin’ machine in the name of peace. 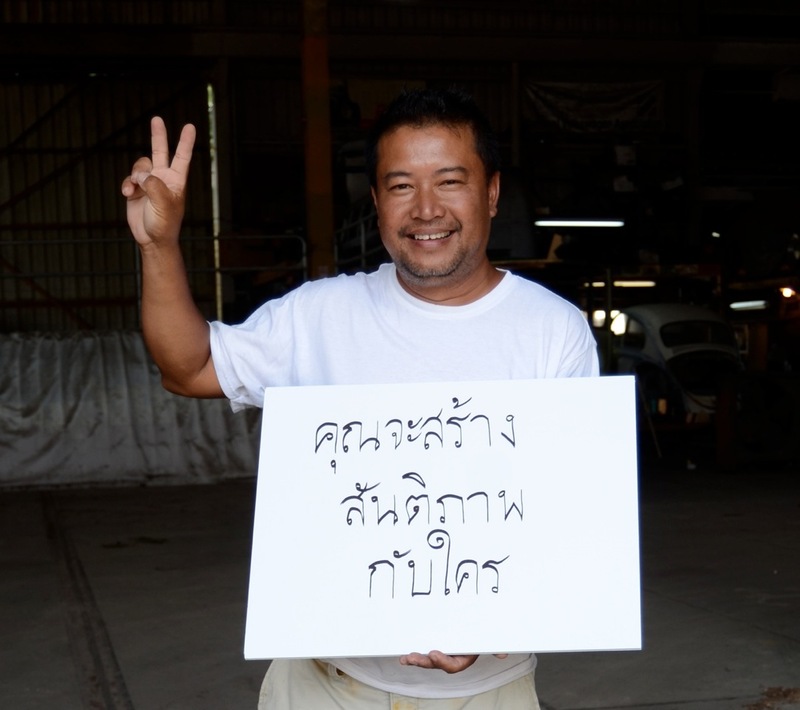 Local Artist, Kumpa Tawornprom…asking…in Thai. Please check out Kumpa’s innovative artwork on his website listed below. Joy is peace dancing. Peace is joy at rest.